My latest recipe card is for coconut cream pie & it came from my nephew, Sean. 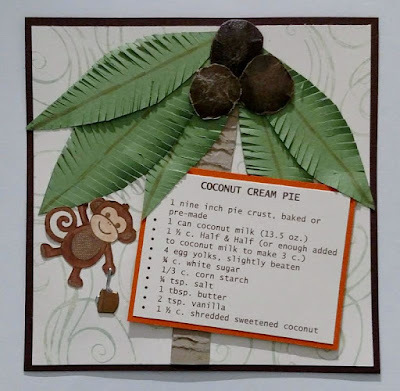 I made the pie for my youngest son's birthday & decided it would be a good companion recipe card for Pam's Pie Crust that I did a few months ago. It's hard to believe I didn't have any DSP that fit the recipe so I made my own background with a flourish stamp...can you envision the monkey swinging through the trees? The coconut tree trunk is a 1/2" strip of CS that was torn in small pieces then overlapped & adhered back together. The leaves were hand drawn then fussy cut. I used fringe scissors, cutting at an angle to finish them off. I collaborated with my bestie, Lisa to design the coconuts. We used a grass stamp on CS then embossed it with a flat EP. Once cool, 3 circles were punched out then fussy cut around the edge so it didn't have a perfect shape. We used a stylist so it had a slight curve then they were added using dimensionals. The monkey was colored with Copics then fussy cut out & is holding a sauce pan brad. Thanks for looking & hope you enjoyed my project! SUPPLIES: SU Cardstock - Chocolate Chip, Vanilla, Wild Wasabi, Pumpkin Pie, Crumb Cake; Ink - Ranger Archival Jet Black, Tim Holtz Shabby Shutters; Stamps - Hot Off The Press Cute Monkey, Tim Holtz Stampers Anonymous Sketch Elements, Judith & Heather Grass ; Misc - SU Fringe Scissors, Eyelet Outlet Pan Brads, Heartfelt Creations Flower Shaping Essentials, Copics E53 & E57, Tombow 992, WOW Clear Embossing Powder.